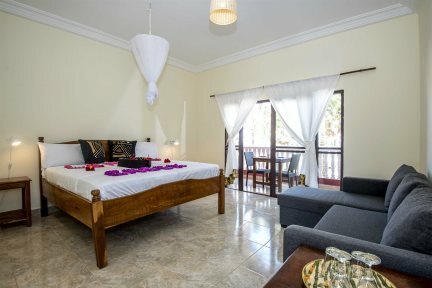 A popular, beachfront hotel run by friendly staff and presenting a quiet setting in which to relax and rejuvenate, Lemon Creek Hotel promises a fulfilling and sun-kissed holiday in a beautiful location of The Gambia. 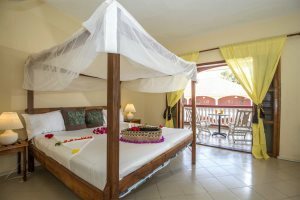 "This is a great value hotel located in a peaceful area so you can relax in whichever way you please, by the inviting pool or on the uncrowded beach – perfect for a stroll. 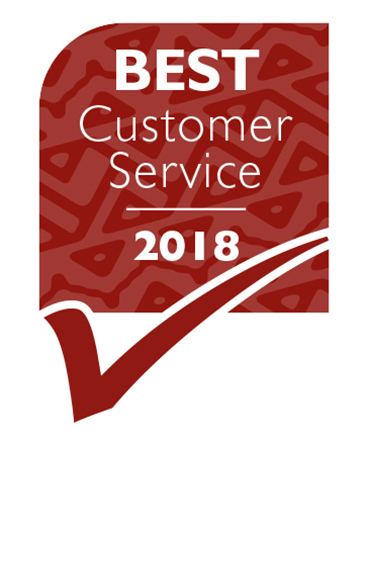 You'll have a very warm welcome from the staff." The elevated location – offering wonderful views out over the creek and beach beyond. 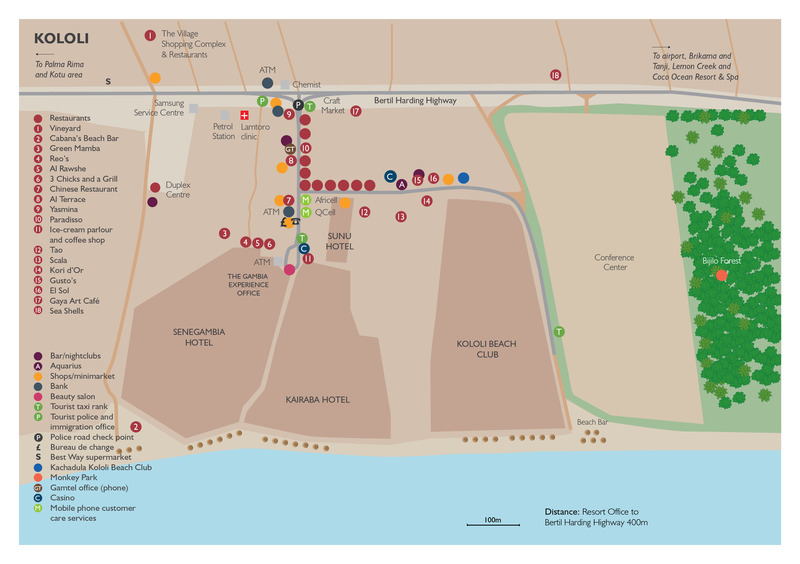 It is only a 10-minute taxi ride to Kololi for a wide choice of bars and restaurants. It's possible to pre-book air-conditioning. Lemon Creek has a strong eco-friendly ethos so it's not included as standard in order to conserve electricity. Boasting superb views across bougainvillea and palm-filled tropical gardens down to the ocean, Lemon Creek has a distinct quiet charm about it. Its fantastic location along the golden sands of Bijilo Beach make it a superb choice for beach lovers, where you can take a stroll or relax on the sunloungers whilst listening to the waves. Within the grounds, a uniquely shaped pool can be found hidden amongst towering coconut palms, which offers a wonderful sense of seclusion, and multiple pockets of sunlight and shade. It’s safe to say, you’ll find relaxation easy to come by. 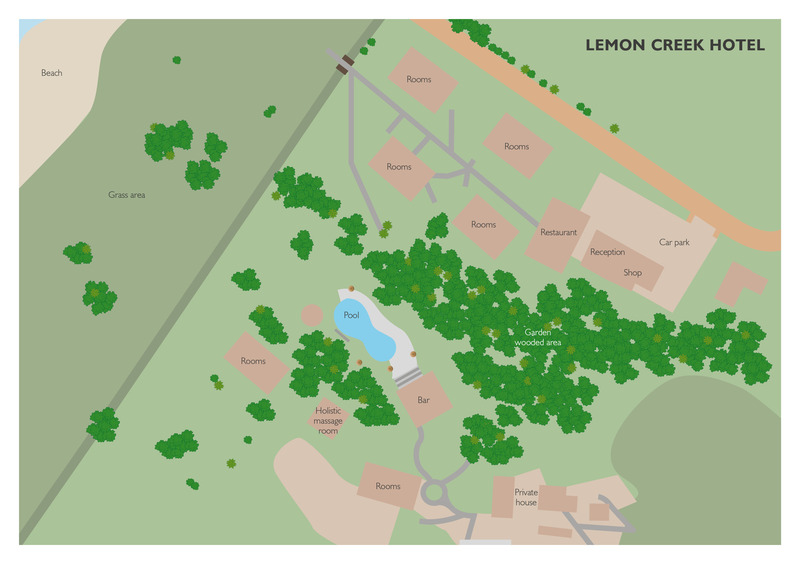 Lemon Creek’s standard and studio guest rooms (available until end April 2019 only) are arranged in blocks which are dotted around the grounds, with double beds (some four poster), simple kitchenettes (studio only this winter) and a terrace or balcony, so you can make the most of the beautiful garden and sea views. 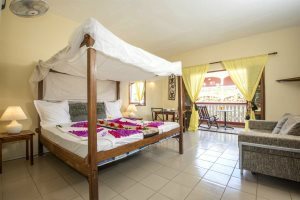 The standard rooms are simple and spacious and all have their own balcony, while you can also choose from larger superior rooms, some with sea view available on the ground floor with their own terraces. Lemon Creek aims to minimise its impact on the environment through management of energy, water and waste materials with recycling and other initiatives. This means that energy conservation is a priority, so air-conditioning is not included as standard in the rooms. However, this is available for purchase at a supplement. 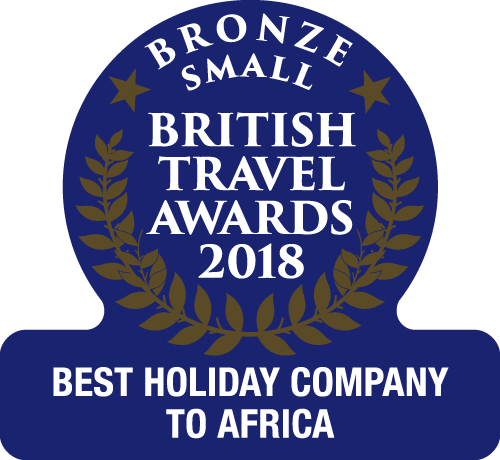 If you’re excited by the culinary offerings of The Gambia, the hotel’s restaurant offers simple yet tasty food, utilising homegrown produce where possible, and is the perfect setting to enjoy a peaceful meal with friendly service, all whilst watching the beautiful orange and pink hues of the sunset. Occasionally, guests will also enjoy a visit from one of the local drumming troupes during dinner, but generally speaking, the emphasis is on tranquillity and relaxation. A short taxi ride will take you to Kololi which offers a wide range of bars and restaurants if you are looking for a change of scene. Open year-round, Lemon Creek offers a great value option for a beachfront holiday during summer months when the Mediterranean resorts become crowded – a problem that won’t be experienced on the vast stretches expanse outside this tranquil property. The standard rooms are simple but well equipped and spacious, each with their own balcony which looks out across the grounds to the ocean. The superior rooms are larger than the standard rooms. All have their own terrace, which look out across the grounds to the ocean. The standard sea view rooms are well equipped, light, airy and spacious and all have their own balcony with a direct sea view. The ground floor studios are simple and spacious and all have their own terrace looking across the grounds to the ocean. They have a kitchenette with fridge and oven. The ground floor studios with sea view are light and spacious and all have their own terrace with a direct sea view. They have a kitchenette with fridge and oven. The superior rooms are larger than the standard rooms. All have their own terrace, which look out across the grounds to the ocean with a wonderful sea view. The beauty of Bijilo is there is very little here! Situated about five minutes south of Kololi there are as yet no restaurants or nightclubs to disturb the peace, just a couple of beach bars on a long stretch of beach with very few people on it. This is a wonderfully unspoilt, long stretch of sand with only a couple of smaller hotels here and beach bars with the odd fruit seller - perfect for a relaxing day.